There are many things I want and expect from MMOs and one thing is housing. I love feeling as if I was in a virtual world and for me, having a little home in there that I can customize is just part of it. I’ve been what I call a “housing tourist” in some MMOs… this is like an MMO tourist who travels through MMOs always looking for “the perfect one”, only that I did not check out the MMOs themselves, but mainly the housing features, hoping to find an MMO that satisfies my needs when it comes to player housing. So I decided to start this little series giving short introductions to housing in some of the MMOs I’ve been playing. I will try to give relatively short overviews of how housing works in each of those MMOs. 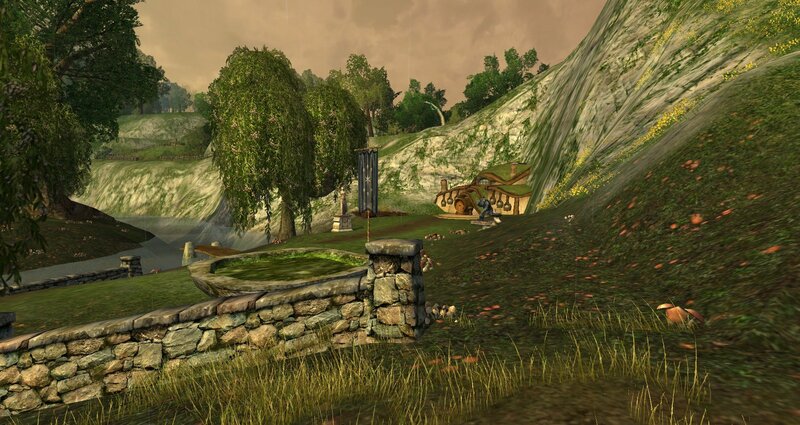 The first one will be the first MMO with housing that I played: Lord of the Rings Online. I had first played Lotro during their open beta for a short bit. The setting was great, but it didn’t offer me more than World of Warcraft at the time. When I heard it had gotten housing (at some point after launch), it finally got my attention. I read about it in gaming magazines, I knew it had some limits, but I wanted housing! Bookahnerk looked at the articles and scoffed. I remember him smirking on top of the scoff and saying something like: “This is nothing compared to Ultima Online!” I nodded, having heard about that game quite a lot and replied: “But I don’t care. Any housing is better than no housing!” After I’d been playing Lotro for a bit, he heard me say: “No housing actually is better than Lotro’s housing.” Of course, this is highly subjective and others may love the housing in Lotro. I see the housing and I wish for more. The foundation is there, but its execution is lacking, but let me introduce you to Lotro’s housing first, so you can get a better picture of it. You need one character that is level 15 at which point you can buy your house. A standard house costs between 950 silver and 1 gold 150 silver. There is no difference in the size of the houses. Some houses are just in a nicer street, I guess. ;) A deluxe house costs between 7 gold and 8 gold 50 silver. There are recurring fees. You have to pay between 47 silver 50 copper and 172 silver 50 copper per week. If you don’t pay for a certain amount of time, your house will be closed and will be available again to buy by others. Your furniture will wait for you, of course. As mentioned above, you can either choose a standard house or a deluxe house. The difference is that the deluxe house is a bit bigger and lets you place more items (see next question for more information about that). Other than that, you can freely choose a house belonging to one of the four playable races: Men, elves, dwarves or hobbits. Depending on your choice, your house will be close to the chosen race’s region in Middle-Earth, e.g., Hobbiton for hobbits. Your house will be in a “neighbourhood” which is an instanced area. Each neighbourhood consists of a map with 4 kinship houses, 10 deluxe personal houses, and 16 standard personal houses. So you will actually have other players as neighbours! Yes. 22 interior (inside the house) and 5 exterior (your garden) “hooks” (see “Additional information” below for an explanation on hooks) for standard houses, 47 interior and 7 exterior hooks for deluxe houses. No, you can’t. You can only upgrade the size of your storage chests (see next questions about advantages), but that’s about it. Yes. You get a skill that lets you teleport to your house. Your house is in an instanced area next to that race’s starting location. Those starting locations also have the race’s major town close. It is very convenient to have such a teleport skill, even if it involves travelling from your house’s neighbourhood outside of the instance to your location. Additionally, every house comes with a storage chest that lets you store items. You can expand the size of those chests through in-game gold and for the biggest sizes, via mithril coins (which are bought with real money). One house per server per account. Although you can buy a kinship house with your alts (see “Are there guild houses?” for information on kinship houses). 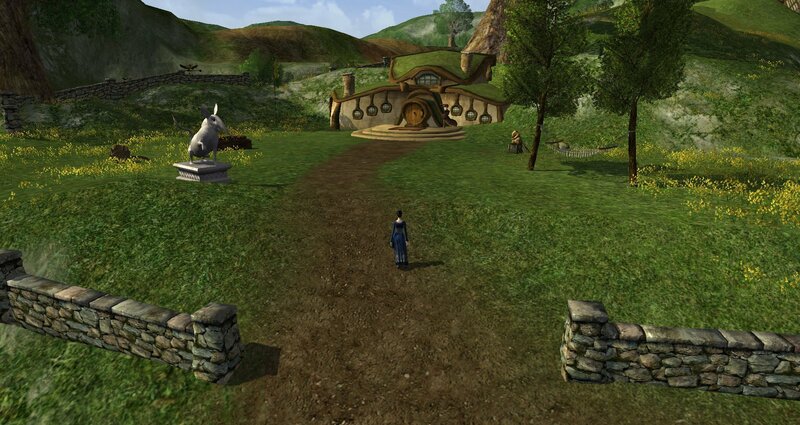 Yes, you can buy a house for your kinship (a guild in Lotro). One kinship house per guild. They also have recurring fees every week, but a higher item limit and the houses are much bigger. You can form a kinship with alts (yours and those of friends, for example) and buy a kinship house that way. I need to elaborate on this first. Lord of the Rings Online is free to play with an optional subscription. There are three different tiers: Free player, premium player and VIP player. Free players who have never spent anything on the game have a gold cap of 2 gold. Premium players are players that do not pay for a monthly sub, but who have bought something in the Lotro store for real money already. Premium players have a gold cap of 5 gold. Compare that to the price of the lowest deluxe house (7 gold) and you can see that it’s impossible to buy a deluxe house this way. So you can either stick with a standard house or upgrade to VIP (= pay a monthly fee) for at least one month, to get rid of the gold cap temporarily. Then you can buy the deluxe house. You can keep it even without being a VIP as long as you pay the recurring fee for your house. Another option would be to buy the “gold cap removal” for 495 Turbine Points (TPs are the currency you buy for real money and spend on their shop). A better deal for your money would probably be the Samwise Gamgee’s Starter Pack, which costs $10, but you get more than just the gold cap removal. 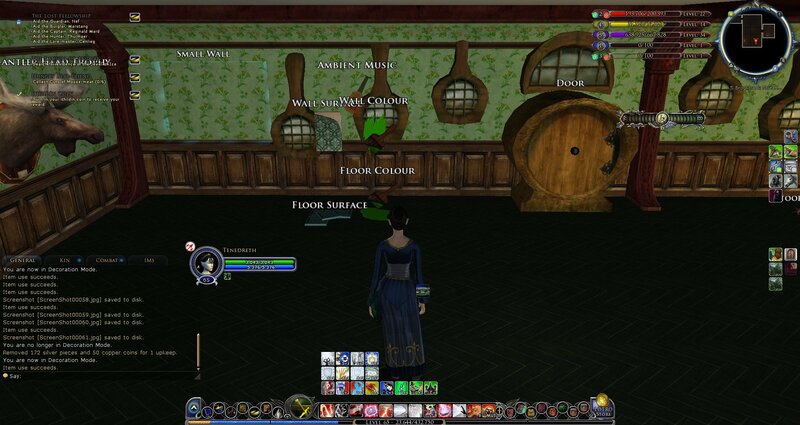 You can choose a house from one of the four playable races (elves, dwarves, humans or hobbits). You do not need to get the house that belongs to your character’s race. I absolutely love the design of the races’ houses. Of course, I chose a little hobbit hole for myself. They’re adorable! The general layout of the houses differs from race to race, but other than that, the houses are identical throughout the areas. This is a friend’s house which I can almost see when looking down from my own house. The neat thing about housing in Lotro are the neighbourhoods with real players as neighbours. I am fortunate enough to have a house in the same neighbourhood than bookahnerk, two of our friends and mine and bookahnerk’s alts’ kinship house. We’re one big happy neighbourhood-family! If we were all visiting our houses at the same time, we could see each other! Neighbourhoods are open for everybody to enter and the garden surrounding the house can be seen by everyone entering that neighbourhood. The interior of your house is instanced. You can decide if it’s public or not. Mine is, so you can have a look at it whenever you like. Small bed belongs to “large furniture”, so can only be placed in “large furniture” hooks. Before we have a look at the gallery, however, I will tell you why, despite my initial enthusiasm, I really dislike housing in Lotro. It can be summed up with one single word: Hooks! As mentioned above, every house has an item limit. For my deluxe house, this is 47 interior and 7 exterior “hooks”. A hook is a place where you can put an item. This means that you cannot freely place the chair on the ground. You have pre-defined hooks and only *there* are you allowed to place your chair. But that’s not all. Items are divided into several categories. A chair is a “small furniture”. Small furniture one can only be placed in hooks that are for small – or large – furniture. It does not work the other way around: Large furniture can only be placed in large furniture spaces, but not in small furniture places. This also means that I will never be able to place a chair next to my table. Items can also only be rotated on one axis. I can rotate the chair so it faces the fireplace, but I cannot topple the chair over as if my character had to leave the place hurriedly or whatever other scene I could imagine. The colour and the look of the wall and the floor can be changed. One thing I do like is that you can change the wall’s colours and the look of the tapestry (same for the floors) and you can add ambient music to your house. But all in all, this housing is very, very limited. Even though I thought I would be happy to have some kind of housing at all, all it did was leave me yearning for more and I think I would really prefer no housing over such limited housing. I can see the prettiness, but I cannot build with it and that makes me sad. Main room of a hobbit’s standard house (bookahnerk’s house). An uninhabited, empty deluxe house in a dwarven neighbourhood. An uninhabited, empty standard house in a dwarven neighbourhood. Dwarven kinship house from the outside. A hobbit deluxe house from the outside (from a random neighbour). Hobbit kinship house with its hooks. Hobbit kinship house from the outside. Only feature I like are the trees I placed outside. I love the looks of the houses in LotRO. But the limitations would drive me bonkers. Everquest 2 just got me too spoiled with the ability to place furniture anywhere and that is the minimum I expect for housing in any game nowadays. 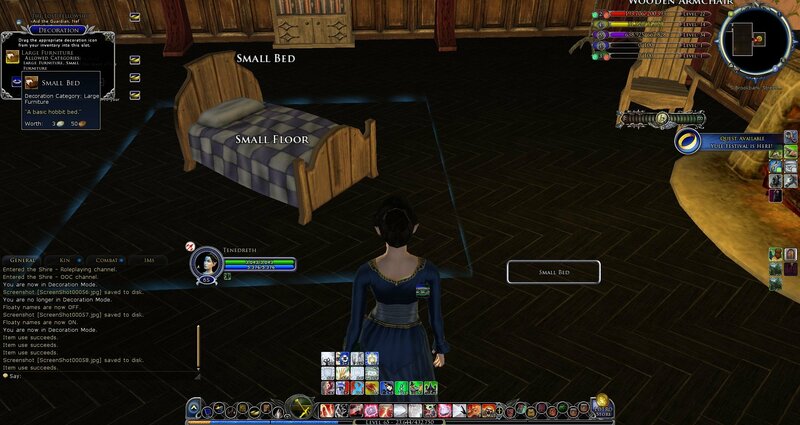 The size of the houses also bothers me a little but that may be a part that Everquest 2 spoiled me in a bad way. One thing LotRO housing does right though (besides looking very beautiful) is the scale of the interior. In other games the interior all looks like it was made for giants. In LotRO the architecture looks more like it was made for the race that lives in there. It feels a lot more natural and immersive when you tour those places. I bought a house in EQ2… then decided not to stick around, after all. But the main reason for checking it out when it went f2p was that it has housing (and in general, if I fall in love with a f2p game, they do get some money from me and in this case, it was spent on a house ^^). Rift has taken that spot now of the f2p MMO that gives me the kind of housing that I want. I just miss those neighbourhoods. They’re a great idea. And I like the idea of neighbourhoods too… The only problem I have with it is that it can be hard to get one where you can be together with all your friends. I think at some point, I was in the same neighbourhood with my friend, but then I wanted a deluxe house instead of a standard one and those were all taken. *sigh* So I moved away. I had also chosen to live amongs the humans for a bit, but then moved back to the hobbits. At some point, I told bookahnerk about an empty standard house as he likes the layout of the small houses more and that was available in our friend’s neighbourhood. Now, after they took away the houses from the inactive players, I had the choice between 3 or 4 deluxe houses in her neighbourhood! :D I told our other friend about it and he bought one of the remaining ones. Restriction with 2 gold caps for free players?!!! i`m not gonna play this in my life!! !